It’s THAT time of the year when holidays to warmer climes start being planned, so if you’re not working with some kind of tanning product now then I suggest you get to it – stat! I’m off to Europe in just over two weeks’ and my pasty skin needs all the help it can get, and I’m guessing that I’m not alone in needing a quick fix. Fast. If you’re a fake tan newbie or just reticent about applying them yourself, rest assured there are some excellent new releases about to hit the shelves courtesy of those kind people at Bondi Sands. Blurring the lines between self-tan and makeup, the Australia-based company’s brand-new GLO range (above) provides instant colour and texture with lasting effects – and it’s pretty much foolproof. Think skin perfecting shimmering colour and high shine luminosity that smooths out imperfections, and it’s easily customisable for the ultimate in bespoke tanning. 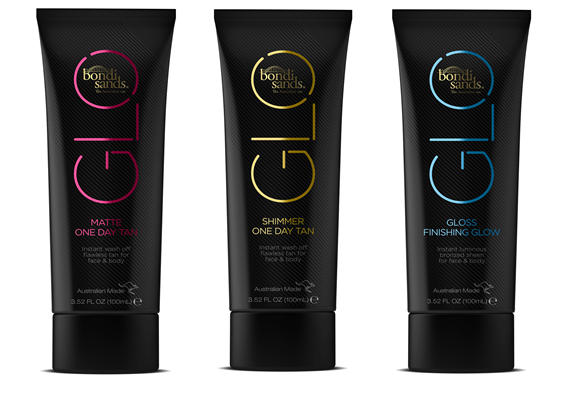 GLO MATTE ONE DAY TAN: this provides instant lustre and matte colour to skin. The skin perfecting formula can be used to top up natural or self-tans, or to contour the face and body with a bronzing brush. 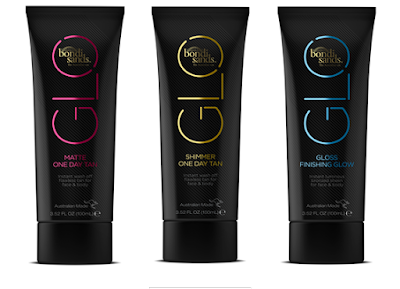 GLO SHIMMER ONE DAY TAN is designed for that lit from within glow, and is infused with innovative light reflecting particles to highlight, giving a glistening bronzed finish. It can be buffed across the collarbone, cheekbones, eyelids and more, and even mixed in with foundation to give an all over, super delicate sheen to skin. GLO GLOSS FINISHING GLOW can be worn on top of GLO Shimmer, GLO Matte or alone, and delivers both colour and texture to create a bronzed dewy-look. Thus far I’ve tried applying GLO on my legs and arms using my Bondi Sands Tanning Mitt to make sure I get an even, streak-free finish, but when used on the face, the formulas are best applied with a makeup brush (although I haven't tried a Beauty Blender as yet). And like any faux glow, be sure to allow a few minutes for the product to absorb into skin before getting dressed. To remove, simply wash off with soap and water. Pretty cool, huh? Bondi Sands brand-new GLO Matte One Day Tan, Shimmer One Day Tan and Gloss Finishing Glow, have an RRP of $22.99, and will be available at Unichem, Life Pharmacy and Farmers stores from August 2018.